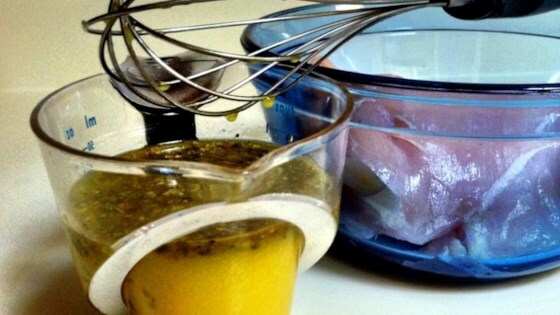 "This is a yummy, flavorful marinade that livens up bland chicken dinners. However, this could also be used on pork chops, fish and turkey! I made this with brown rice and used some of the unused marinade as a sauce to pour over the rice. DELICIOUS!!!" Whisk lemon juice, olive oil, garlic, mustard, and oregano in a bowl. Let chicken marinate in this for about an hour, then prepare as usual. good and easy to do! on a side note, you should never add salt to marinades because it pulls moisture out of the meat. Great recipe! Added lemon zest instead of lemon juice to recipe. Marinated one hour added juice from one small lemon right before I grilled chicken. Very good & versatile. I will use this again.